This week's Geek Speak will feature one of Saturday Night Live's greatest graduates, the ever hilarious Will Ferrell. 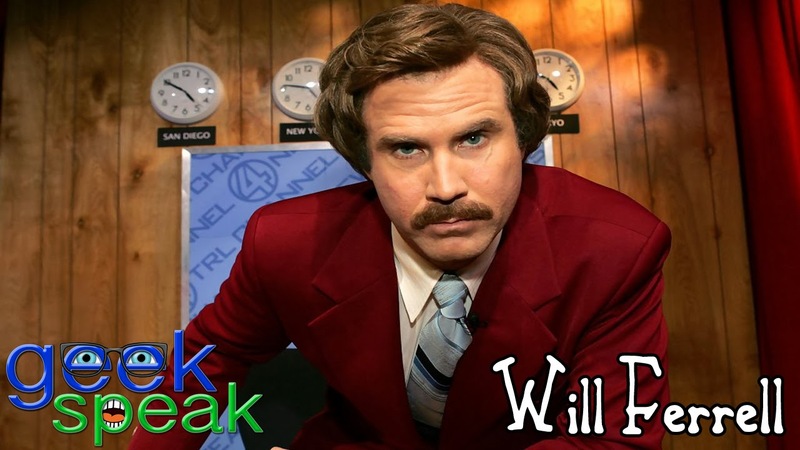 As we prepare for the long awaited sequel Anchorman 2 releasing in theaters this week, we will check out the first Anchorman film along with other films from Will Ferrell's career. Anchorman: The Legend of Ron Burgundy - Ron Burgundy is San Diego's top rated newsman in the male-dominated broadcasting of the 70's, but that's all about to change for Ron and his cronies when an ambitious woman is hired as a new anchor. Stranger Than Fiction - An IRS auditor suddenly finds himself the subject of narration only he can hear: narration that begins to affect his entire life, from his work, to his love-interest, to his death. Talladega Nights: The Ballad of Ricky Bobby - #1 NASCAR driver Ricky Bobby stays atop the heap thanks to a pact with his best friend and teammate, Cal Naughton, Jr. But when a French Formula One driver, makes his way up the ladder, Ricky Bobby's talent and devotion are put to the test. Step Brothers - Two aimless middle-aged losers still living at home are forced against their will to become roommates when their parents get married.